Star Hammer: The Vanguard Prophecy is one of my favourite Australian-developed games ever. As a fan of 1) space combat, 2) tactics strategy games, and 3) those things brought together, Star Hammer scratched an itch that is far too often left wanting. When developers these days are all about action and drama in space, having a game that imagines the tactics of space combat was a lovely change of pace. 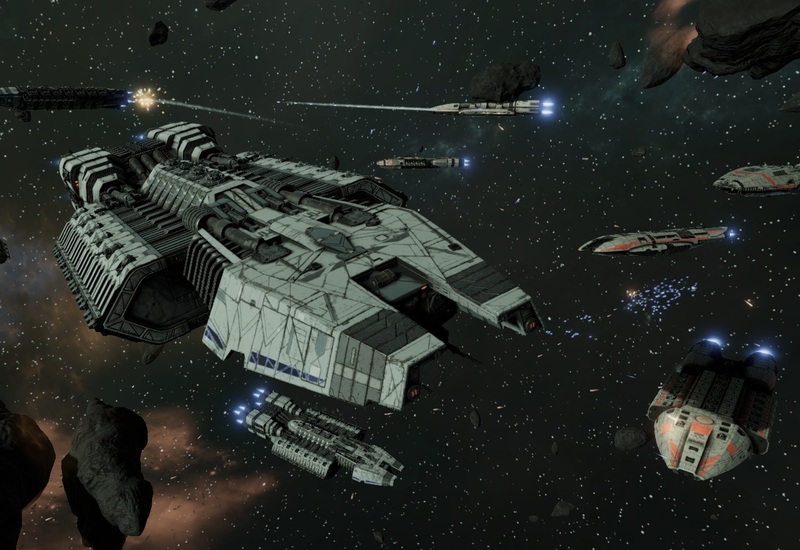 That developer, Black Lab Games, is based in Perth, and will soon unleash an even more exciting game project; a space tactics game set in the Battlestar Galactica universe. Taking on fleets of Cylons. Squeeeeeee! That's one that we have pinned as being a real sleeper hit for the local industry. So for this week's fast five, we just had to interview the head of Black Lab Games, Paul Turbett. Thanks for realising our space fantasies, Paul! Related reading: Read Matt's review of Star Hammer: The Vanguard Prophecy here. Paul T: We are in the final stretch of developing Battlestar Galactica Deadlock, which is a strategy game based on the TV show that ran from 2003-2009. It's being released on PC on August 31st and later in the year on Xbox One and Playstation 4 by our publishing partners at Slitherine. It's the first new BSG PC & console game for quite a while, and as a massive fan of the series it's pretty unbelievable to be have this opportunity! I think it's going very well. The game has been in beta for a few months, and we've been getting some great feedback, both from players loving the game, and offering suggestions for improvements and changes. Paul T: Being based in Perth we are a bit removed from most of the industry, so it's a little hard to talk about the industry as a whole, however it does appear to be surviving, albeit it in a bit of a lull. Their were a number of high profile releases a couple of year ago, and a lot of excitement about the future potential for the industry here, but it sort of feels like that's died down a bit. Or maybe I've been too busy to notice what's being going on because I've been so immersed in BSG for the last 18 months! It's a bit frustrating that despite the economic and cultural impact of games, as an industry we are still undervalued and ignored - such as the non-response to the Senate enquiry that handed down it's findings that the industry should get more support well over a year ago. That said, we also need to take responsibility for ourselves as an industry, which I think we are doing, and getting on with the job of making great games. Paul T: I don't know if it counts as recent, but No Man's Sky, for a couple of reasons. One, it's amazing what such a small team can make. Black Lab is pretty small too, so I'm always impressed by seeing a small dedicated team make something really big and empathise with the difficulties they face just making a game of that size and scope. Second, it's a really interesting and rewarding game to play! Paul T: I really like that technology is much less of a limiting factor in what games are made, and that their is more focus now on game design and crafting "the experience". Technology is more or less a solved problem. When I started making games (a long time ago), just getting graphics on the screen was a challenge. With the ubiquity of game engines like Unity and Unreal, and games-capable devices being everywhere now, developers have to worry less solving technology problems to create the experience they imagine. We can more easily experiment with game mechanics, new art styles, or new genres. Something I'd change? Hmm. It's been well documented that some developers suffer a lot of online abuse from a small proportion of gamers, when the developers are usually just doing there best and working within limits that they can't always control. It would be nice if that didn't occur. Paul T: I have to admit that I'm not really familiar with all things Miku, so I'm going to have to say, I don't know. Sorry!